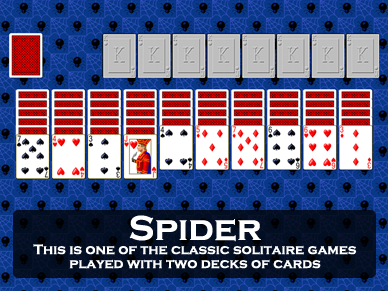 Screen shot of the game Huge Spider from Pretty Good Solitaire. 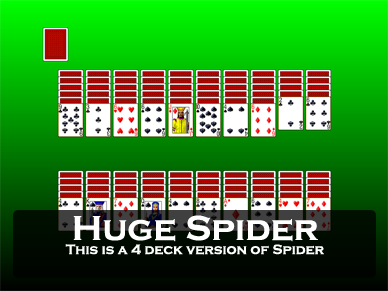 Huge Spider is a four deck variation of Spider. It follows the rules of Spider quite closely, but nevertheless is considerably easier than Spider. In Huge Spider, there are 20 tableau piles in two rows of 10 each. Six cards are dealt to the first eight piles and five cards are dealt to the remaining 12 piles. Only the top card of each pile is face up. The remaining cards form a stock. In the tableau, building is down regardless of suit. 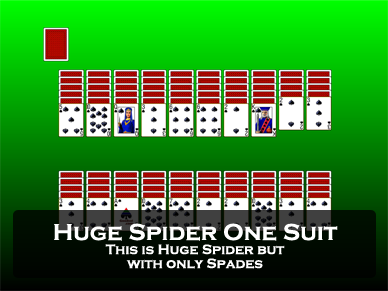 Groups of cards in sequence down by suit can be moved as a unit, therefore in suit building is to be preferred. Any card may be played to a space in the tableau. When play comes to a halt, clicking on the stock deals one card to each tableau pile. Whenever a sequence of 13 cards from King down to Ace in suit is formed, it is removed from play. 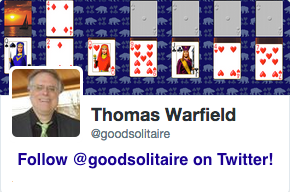 The object is to remove all cards from play, requiring the building of 16 suit sets of 13 cards each. 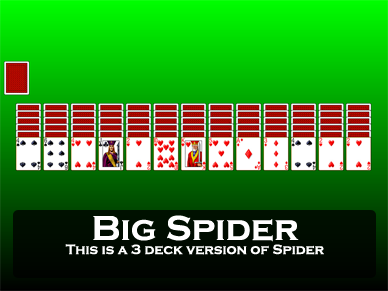 Despite having exactly the same number of piles and cards in the stock relative to the number of decks (exactly twice as many in the four deck Huge Spider as in the two deck Spider), Huge Spider is considerably easier than Spider. With four of each card available, it seems easier to build sequences. 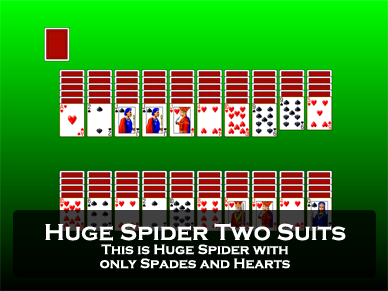 An average player should be able to win at least half the time, although like most Spider games, it is likely that all but a few games are winnable. 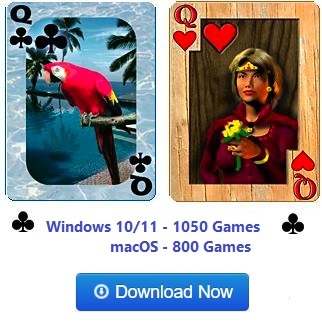 Huge Spider is one of the 850 games in Pretty Good Solitaire.